THE HEART OF THE INTEGRATED ENGINE. We build it. You rev it. We're not just using marketing buzzwords here (though they do sound cool). We're pairing more than 40 years of advertising expertise with our unique and innovative integrated services. That's a cutting-edge combo designed to deliver results. Look under the hood of our integrated engine, and you'll find a finely-tuned machine. 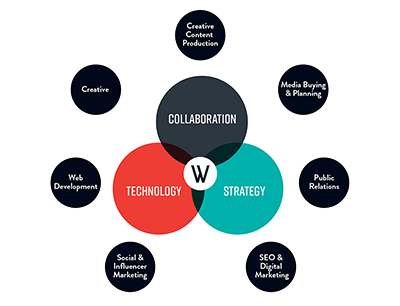 We bring together three core components – collaboration, strategy and technology – to create the momentum that connects your brand with the combination of our services that will drive engagement where it needs to go. Collaboration: We work with you every step of the way to achieve better marketing solutions for your brand. Strategy: We dig deep, using creative ideas and strategic insights to build a solid strategy around your business objectives. Technology: We are tech-driven, investing in the newest and most effective digital tactics that present your brand to audiences in revolutionary ways. "Because of their inherent flexibility, PWAs are the best way to stay ahead of the curve in the mobile industry." Large hotel chain saw a huge lift because of increased engagement due to a faster and better experience. Lead to higher click through rates, higher conversion rates and increased sales. No purchase or download required like native apps means consumers are more likely to engage with unique brand experiences that won’t take up valuable space on their phones. Major business magazine moved its mobile experience to a PWA and saw a massive increase in speed in its load times. Large cruise ship brand increased conversions with the push notification feature of their PWA. They also saw a 24% opt-in rate. All stats are for brands' PWA performance as baseline information. Workshop did not build or work with the above brands. 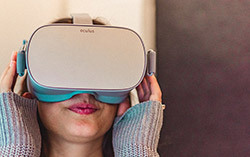 Unique experiences: By using VR to reach your customers, they're interacting with your brand in a whole new way, turning traditional into a more engaging experience. No ad blockers: Bypass that web-based pitfall with an immersive VR environment that will knock your target audience's socks off. Sure, it could be an ad, but it's not positioned in the traditional way. And that can produce better ad recall. In fact, 70% of VR users found these types of ads less intrusive. The virtual reality market is estimated to reach a value of 12.1 billion U.S. dollars. According to findings from Advrtas, an AI powered Immersive “Smart” Ad solution, 360° VR significantly outperforms traditional media.